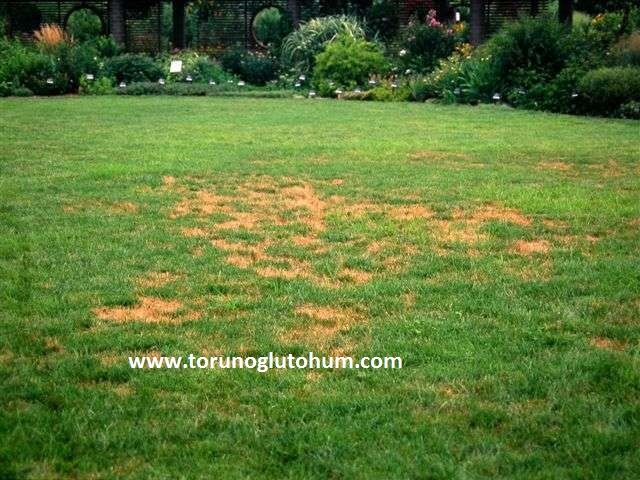 Grass diseases are caused by the misapplication during the preparation of the soil to be added to the grass, during grass planting, during grass fertilization and grass fertilization. It is always difficult to get results in the treatment of grass diseases. Early detection of grass diseases and problems is extremely important. 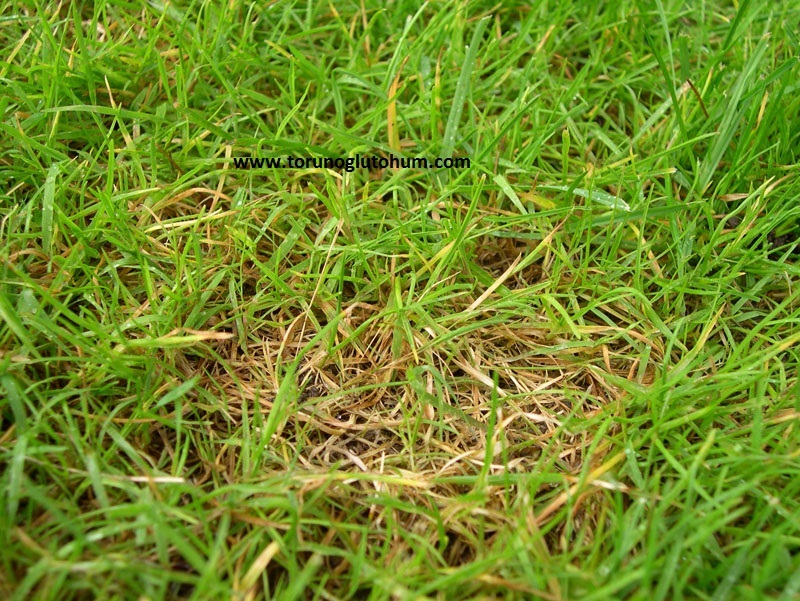 Grass diseases are more common in grass cultivated for months. The mistakes are corrected in the grass treatments and necessary spraying is done. What are grass diseases? Findings are found in sowing made in warm weather except autumn and early spring plantings. The diseased field is covered with a white layer over the leaves when the grass is dew in the early hours of the morning. The fidelites germinated due to extreme hot air and humidity will fade and die as spots on the round face. 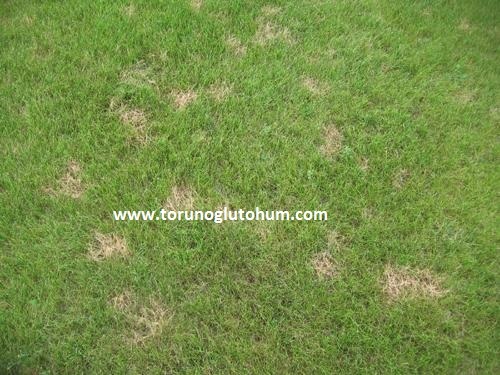 The disease is caused by fungi of the genus Pythium, Rhizoctonia and Fusarium. The mushrooms, seeds and sprouting germs that are present in the soil due to the influence of the nematode in the grass cultivated in hot weather jams. It triggers high temperature, humidity, stagnation, excess fertilizer and very seed disease. By using the seeds in the appropriate amount, preparing the seed bed properly and preparing the appropriate environment for the development of the plant, the development of the fungus should be prevented. When the disease is seen, nightly watering should be cut and appropriate fungicides applied. Spraying is repeated at least three times a week. May - June, spring and autumn weather warm and humid grass area round brown spots of straw - colored circles about 15 cm in diameter. The small dead zones are irregularly blurred to the point where the lightest brown stains occur. Diagnosis of Disease: Selerotinia causes fungus called homeocarpa. The diseased area is treated with fungicide twice a week -10 days. The grass should be kept dry and irrigation should be done 1-2 times a week. The problem is pale yellow diseased areas 5-30 cm in diameter, with pinkish-colored edges. The end of winter - comes early in the spring. Grass leaves are weak and stick together. The white and cottony plants cover the leaves. 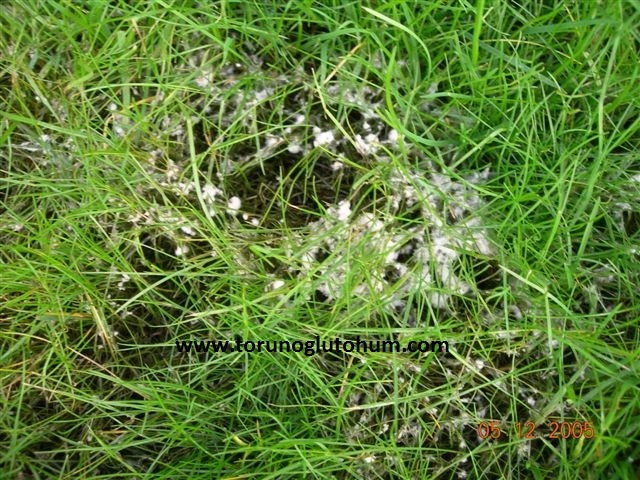 This grass disease is caused by fungus called Fusarium nivale. Snow is seen in the winter and spring months when the soil is constantly moist due to poor drainage from the rain to the yada. When the temperature does not rise above 15 ° C, when the snow is heavy, In general, the snow continues to develop under the snow. It affects more leaves. Even if it grows too much, it could kill the plant. Early in the spring disease begins to be sprayed with the appropriate fungicide. After 10 to 14 days, application is repeated. In humid weather where the temperature is below 15 ° C, repainting is applied. In order to weaken the Fusarium it should be avoided in the autumn with a lot of nitrogenous fertilizer. 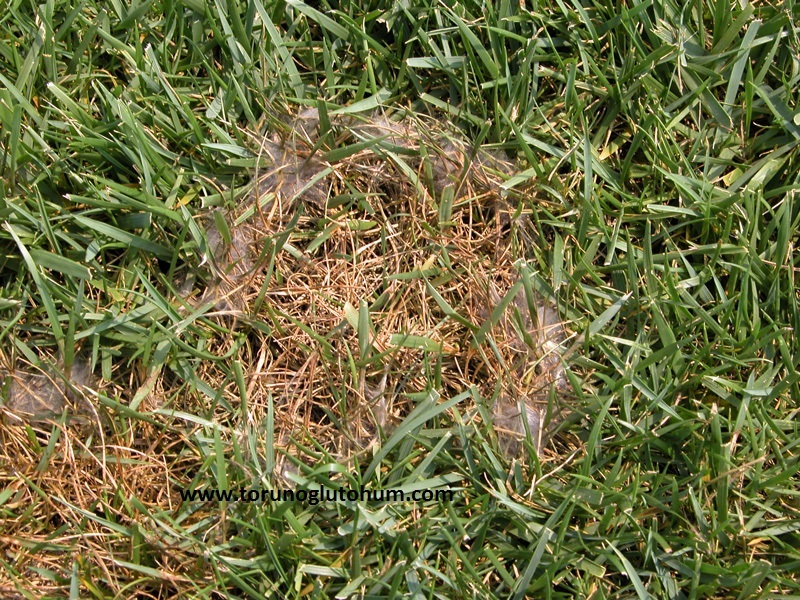 Brown patch disease (brown patch) occurs at 25-30 ° C, circular patches of dead grass at 30 cm in high humidity. Burrowing areas can sometimes be surrounded by hazy dark purple rings. Early in the morning the leaves are covered with a white layer before the dew is dried. Rhizoctonia becomes the so-called named fungus. A patient who affects all grass plants in moist, extreme hot areas. Plants with excess nitrogen fertilizer applied are more susceptible. When the disease is seen, it should be medicated with appropriate fungicide. 3 or more applications are made in 7-10 days. If hot and humid weather conditions continue, spraying is continued. The grass area should be left as dry as possible. Problem: Leaves grow in warmer months from spring to autumn, with irregular stains of light brown color. When you walk on it, the leaves are laid. The grass plant will die in 1 day in some cases. 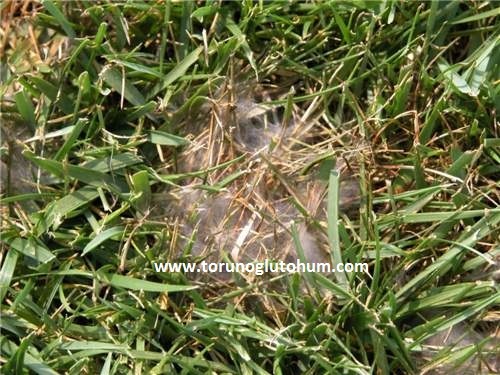 Pythium species (fungus) is the cause. It blooms in the plants affected by the temperatures above 30 C. Due to improper drainage and heavy moisture, the disease comes to the fore. When the disease is seen, it begins to be medicated with appropriate fungicide. The disease should be treated every 3 to 10 days until the end of the month. A badly sick grass may not recover again. The grass must be planted again. Plowed fields show light green-yellow color. The orange color covers the top of the powdered leaves and fingers, shoe polish, rust coloring clothes. Do not rub the reddish brown stain under the rust powder. 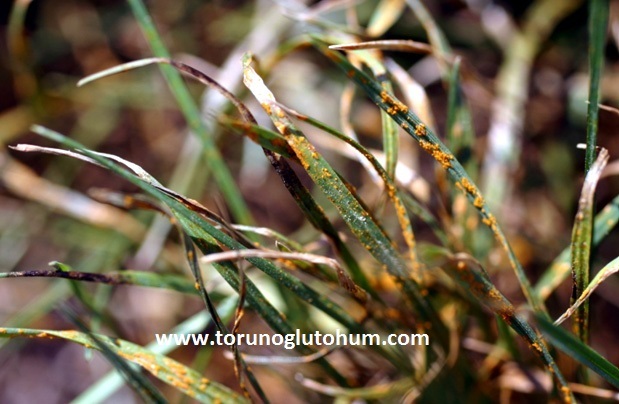 The disease is Puccinia species. Poa and Lolium are more common in grass species. The temperature of 20-25 ° C in humid air is the most active period. It can be effective throughout the winter in temperate regions. Heavily accelerates raw development. Nitrogen and moisture deficiency and low harvested plants are more easily caught in the disease. Rust is seen more intense in the shadow. Spread of wind easily spreads rust. 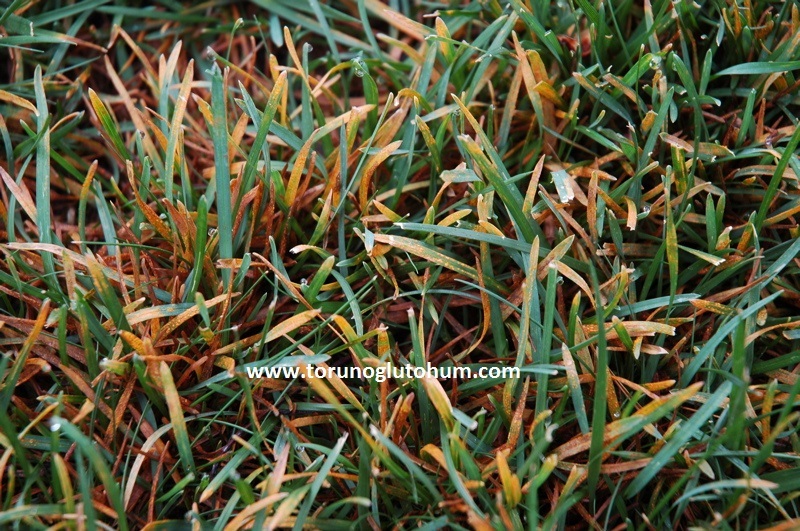 The rate of development of rust disease is lower than the growth rate of grass plant. Nitrogenous fertilizer should be accelerated to grow. Frequent format should be applied. If Rust's disease spreads, it should start spraying. Brown circular spots of 20-25 cm in diameter come to the square. The sickly circles are surrounded by a green ring. Sometimes it is dark green but not dead, circular spots. There is no stain on the leaves and the plant does not sleep. Salts in stools bring damage to levels ranging from color change to death. Nitrogen in the feces leads to the ring growing around the circle quickly growing and dark. The affected area can be watered abundantly and the effect of the people can be eliminated. This is a temporary solution. Over time the grass surrounding the circle will fill this area. The dogs are removed from the grass area. Problem: 3-5 days after fertilization or spraying comes to the waterfall. Irregularly spaced and shaped grass turns yellow. The grass surrounding the shed is dark green with no yellow spots. When chemicals such as chemicals, fertilizers, and gas are used improperly, the grass burns when pushed down. The leaves will dry and die. Damage can be reduced by collecting spilled chemical material. Irrigation is done intensively and polluted grass areas are cleaned. Wash of the chemical material is provided. Spilled chemical water-soluble cinstense is normally given 3-5 times more water. If not (gas, petrol, oily medicines, etc.) the area should be washed with detergent water. Fertilization leaves are dry. Fertilization is not done when the plant is dewy. After Gübred, the irrigation begins. In June, the grass is turned into light green, and then the straw turns into green. Color changes occur more quickly in places that are over-hit. The stains vary from a few cm to 30-40 cm in round crescent or long stains. In general, the middle of diseased stains remains green. This takes the form of an eye. The bottom part of the dead grass leaves - it turns brown in the brown area. This disease is caused by a variety of fungi including fusarium species that live in 25-30C. It affects agrostis and poa species first. Very dry areas, places exposed to hot winds, areas with a pH lower than 6.0 are getting sicker faster. With cool autumn weather, new grass takes its place. But there is a chance that the disease will recur next year. Treatment: First, the dead grass is raked.